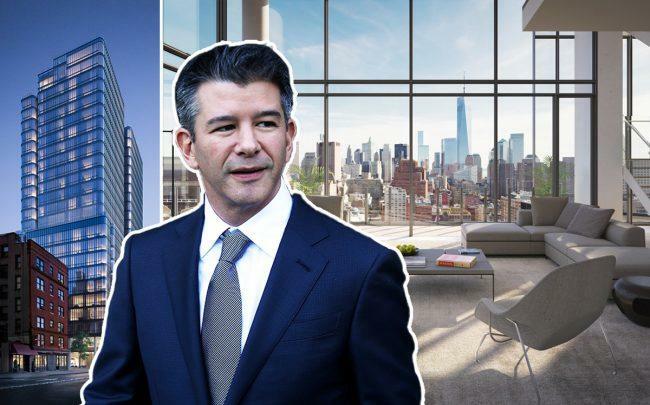 Uber co-founder Travis Kalanick, who was pushed out of the company last year, snatched up a brand new penthouse in Soho. Kalanick bought an apartment at 565 Broome Street for $36.4 million, the Wall Street Journal reported. It was listed for $40.5 million. The penthouse — at an under-construction building — will span 6,555 square feet. The apartment will also have a private elevator, floor-to-ceiling windows and a rooftop terrace with a heated outdoor pool. Bizzi & Partners, Aronov Development and Halpern Real Estate ventures are developing the project. Douglas Elliman’s Stacy Spielman, Andrew Anderson, Benjamin Glazer and James Flowers had the listing. The deal comes as penthouse inventory has piled up, with an increasing number of listings seeing price cuts. Earlier this week, the penthouse at 212 Fifth Avenue got a 15 percent price chop and is now asking $62.8 million. The Broome Street building is expected to be completed by the end of the year, the report said. Amenities will include a mechanical parking system that moves cars into a garage, a fitness center and a 55-foot pool.